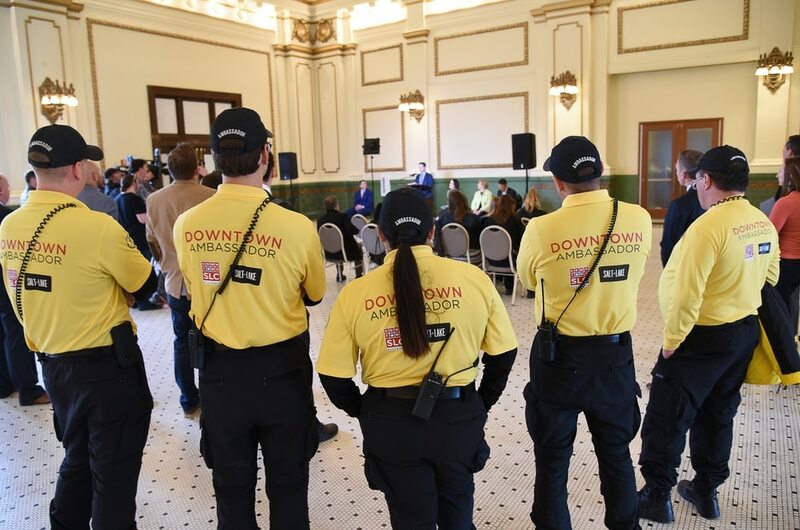 (Francisco Kjolseth | The Salt Lake Tribune) Downtown Embassadors attend an announcement in the Grand Hall at The Gateway on Tuesday, April 2, 2019, as two new reports claim that The Gateway and the Rio Grande area of downtown Salt Lake City has seen a dramatic decrease in crime. Speakers shared details on the efforts and resulting impact the security measures have had on the district. (Francisco Kjolseth | The Salt Lake Tribune) Peggy Hostetter, a long time resident at The Gateway relays her experiences with a dramatic change for the better in her area as community leaders gather at the Grand Hall at The Gateway on Tuesday, April 2, 2019, to share details on the efforts and resulting impact the security measures have had on the district. (Francisco Kjolseth | The Salt Lake Tribune) People attend an announcement in the Grand Hall at The Gateway on Tuesday, April 2, 2019, as two new reports claim that The Gateway and the Rio Grande area of downtown Salt Lake City has seen a dramatic decrease in crime. Speakers shared details on the efforts and resulting impact the security measures have had on the district. (Francisco Kjolseth | The Salt Lake Tribune) Greg Hughes, former Speaker of the House joins other community leaders to relay new reports claiming that The Gateway and the Rio Grande area of downtown Salt Lake City has seen a dramatic decrease in crime. Gathered in the Grand Hall at The Gateway, on Tuesday, April 2, 2019, the 1.4 million square foot lifestyle destination is owned and managed by Vestar, as it goes through a $100 million redevelopment. (Francisco Kjolseth | The Salt Lake Tribune) Greg Hughes, former Speaker of the House joins other community leaders to relay new reports claiming that The Gateway and the Rio Grande area of downtown Salt Lake City has seen a dramatic decrease in crime. Gathered in the Grand Hall at The Gateway, on Tuesday, April 2, 2019, the 1.4 million square foot lifestyle destination is owned and managed by Vestar, as it goes through a $100 million redevelopment. (Francisco Kjolseth | The Salt Lake Tribune) Derek Miller, President and CEO of the Salt Lake Chamber and Downtown Alliance joins other community leaders to relay new reports claiming that The Gateway and the Rio Grande area of downtown Salt Lake City has seen a dramatic decrease in crime. Gathered in the Grand Hall at The Gateway, on Tuesday, April 2, 2019, the 1.4 million square foot lifestyle destination is owned and managed by Vestar, as it goes through a $100 million redevelopment. Peggy Hostetter moved from Seattle to an apartment in downtown Salt Lake City’s west side eight years ago, just as crime began to worsen at The Gateway shopping center and surrounding Rio Grande neighborhood. 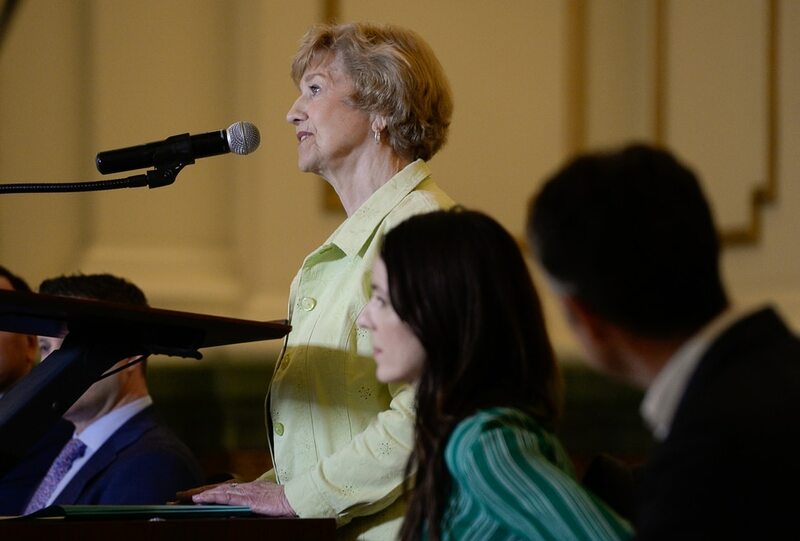 Her dreams for retired life in Utah's capital gave way to routine fears for her personal safety. "It almost immediately started to change my world," said Hostetter, now 81. She began noticing store after store abandon the mall and saw litter, human waste and discarded needles accumulate on the sidewalks along 500 West. The adjacent Road Home homeless shelter was overflowing, she and others recalled, and Hostetter had the police on speed dial for when she witnessed drug deals from her apartment window. Hostetter joined state and business leaders Tuesday to credit Operation Rio Grande in summer 2017 and stepped-up security efforts by mall owner Vestar for a dramatic drop in criminal activity since 2015, a trend that officials say has helped revitalize the wider neighborhood. 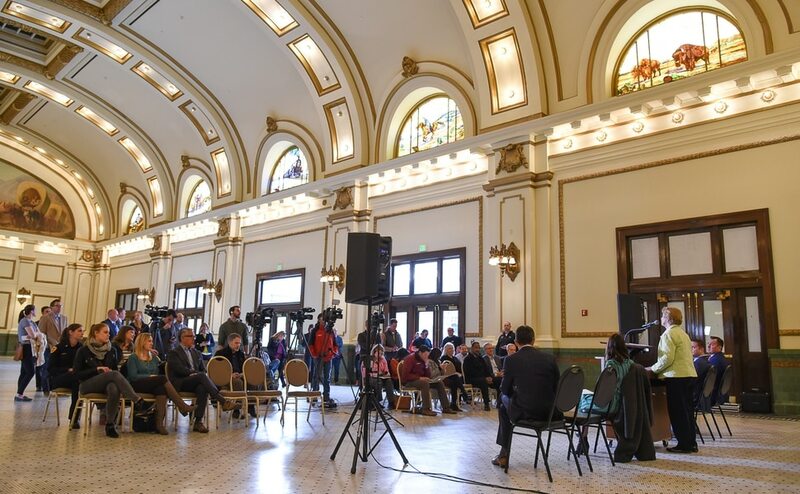 "This is a very different place for me now," Hostetter said at a news conference, held in the Grand Hall of Union Pacific Depot at The Gateway. "I'm perfectly comfortable walking to events downtown." Two new reports — one from the state Department of Workforce Services and another by the private security firm hired to patrol The Gateway — point to improved conditions at The Road Home as well as a marked decrease in felony-level crimes and a range of lesser drug-related, property and behavioral crimes in and around the adjacent open-area shopping center. Those trends have government officials, business leaders and the mall’s owner celebrating. Serious felonies within the two-block shopping center — crimes such as burglary, robbery and fraud — dropped from 26 incidents in 2015 to three last year, according to private security firm Trident Security Services, which began working at the mall in 2017. Drug-related offenses went from 377 in 2015 to 27 in 2018, while property crimes — theft, graffiti and vandalism — fell from 587 to 134 over the same period. Behavior-related incidents — ranging from panhandling, disorderly conduct and trespassing to harassment and indecency — also dropped, from 2,158 incidents in 2015 to 463 three years later, according to Trident. Separate crime statistics from Salt Lake City police show a similar overall decline across the city, with monthly crimes falling by anywhere from 30 percent to 50 percent between January 2015 and the end of 2018. Those declines were most pronounced in the city's Council District 4, which includes the Rio Grande neighborhood, police statistics show. Since purchasing The Gateway in 2016, Arizona-based Vestar has spent nearly $1.5 million yearly on private security as part of a $100 million overhaul of the property, which the mall’s marketing director Jacklyn Briggs said had helped turn it into a public gathering space and venue for 180 separate community events in 2018. Briggs and Dave Kelly, vice chairman of the Pioneer Park Coalition, a group of area business owners, said the neighborhood’s trajectory would likely improve further with completion of a multi-use recreation lawn, additional lighting and other improvements at nearby Pioneer Park. Derek Miller, president and CEO of Salt Lake Chamber and affiliated Downtown Alliance, on Tuesday praised the “great strides” in boosting area security, while thanking police; city, county and state leaders; area businesses and Vestar, for its Gateway investments. "In order for us to have a dynamic city center," Miller said, "we have to ensure that it is welcoming and safe for residents, visitors and for commerce." Former Utah House Speaker Greg Hughes, another key player in efforts to improve the area, praised a range of government officials, community leaders and social service providers for "completely inventing the rules" to create Operation Rio Grande, which began in August 2017. The three-phase plan brought stepped-up police action to restore public safety in neighborhoods around The Road Home. Police jailed some of the homeless while others were sent for medical and addiction treatment, then assisted with job training, employment and housing. The effort drew criticism from civil-rights advocates, who said it was heavy-handed. "We were working in braille," Hughes said of the first-ever collaboration among Utah officials that went into Operation Rio Grande. The Draper Republican said he was "so proud of all the people who left their biases and turf at the door to solve this problem." Hughes said that while Operation Rio Grande may have dispersed some of the homeless to other parts of the city, it also rid the downtown area of drug dealers and others who preyed on shelter clients, making it safe for those living in homeless camps elsewhere to come downtown for services. "I'm not saying the job's all done," he said, "but there is a measurable difference." The shelter, located at 210 S. Rio Grande, is now scheduled to close in the fall of 2019. City, county and state officials are building three new homeless resource centers elsewhere in Salt Lake County. In their report, auditors at the state Department of Workforce Service found that conditions inside the homeless shelter, which the state purchased in October, appear to have improved since a May report highlighted major deficiencies, though they added that more progress is still needed. In the surveys, a majority of residents, employees, volunteers and police officers reported that the shelter was safer, and that illegal drug use and abusive behavior had declined over the past eight months, as had the number of weapons brought into the shelter, state auditors said. But the audit also found shortcomings, including custodians at the shelter not reporting drug paraphernalia; residents not being thoroughly searched upon admission; other lapses in security staffing and surveillance; and restrooms not being cleaned frequently enough.